Skiing can be enjoyed in many ways. At the ski area, you may observe people using alpine, snowboard, telemark, cross-country, and other specialized ski equipment such as that used by disabled skiers. Regardless of how you decide to enjoy the slopes, always show courtesy to others and be aware that there are elements of risk in skiing that common sense and personal awareness can help to reduce. Observe the code listed below and share with other skiers and riders the responsibility for a great skiing experience. 5. Always use devices to prevent runaway equipment. 7. Prior to using any lift, you must have the knowledge and ability to load and unload safely. the Ski Patrol, the ski area operator, or the area manager and shall clearly identify himself or herself. Alpine skiing and snowboarding is a recreational activity that continually challenges the human spirit. To enjoy skiing and snowboarding, you must know and be willing to accept the limits of your ability. Remember that changing weather and snow conditions as well as natural and manmade obstacles are essential elements of this sport and its inherent challenges. Snow making and trail grooming activities may be in progress on the slopes and trails, so always be aware. Collisions with other skiers, snowboarders and objects can cause permanent injury or death. Your enjoyment and your safety will be directly affected by your judgment. 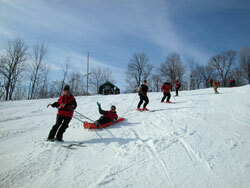 Ski or snowboard only on designated slopes and trails. Likewise, ski or snowboard in control and use caution at all times. Remember, we are trained to save lives, but we would prefer to never meet you in such a compromised position in the first place. Please be safe and enjoy your winter recreational activities. NSAA has once again teamed with Burton Snowboards, as well as the Professional Ski Instructors of America (PSIA) and the American Association of Snowboard Instructors (AASI) in the safety education effort.